HD Radio has a vision for transforming radio and music experiences in vehicles with next-generation Internet-connected services. Implementations are currently underway at Tier 1 automakers around the world and are expected to debut "soon" (in automotive time cycles, that is). Following the DTS and HD Radio merger, I led a usability research project into some new concepts for "Station Following." Supported by meta-data from HD Radio's new Connected Radio service for smart vehicles, the vehicle's infotainment system can automatically transition from a station's terrestrial radio broadcast to their Internet streaming service when the terrestrial broadcast signal gets too weak or is unavailable. And vice versa, when applicable. For example, imagine you're on a road trip from San Francisco to Dallas and you love the local NPR station, KQED. With the Station Following experience, your car's infotainment system can monitor the strength of KQED's terrestrial broadcast signal and automatically switch to its streaming source so that you can continue enjoying their content and programming uninterrupted all the way to Dallas. All without needing to pull out a phone, search for and launch a radio streaming app, and hunting for KQED's feed within it while trying to drive safely on the highway. The Station Following experience is automatic, effortless, and fully integrated into the infotainment system. The purpose of this usability research was to explore a few different options for presenting a brand new feature like this, one that people have no reference points for. In fact, a big challenge facing the automotive industry in general is how to educate drivers with regards to the many new features coming to cars that will soon have constant connections to the Internet. It's a similar kind of conceptual challenge for consumers as the one faced in the transition from old Motorola flip phones to new iPhone and Android smartphones. Imagine someone taking away your beloved RAZR and handing you an iPhone X in 2007! As with conventional HD Radio services, the company sets standards and technical requirements while allowing an automaker figure out how to execute a feature in the best way given their needs and what their infotainment system supports. 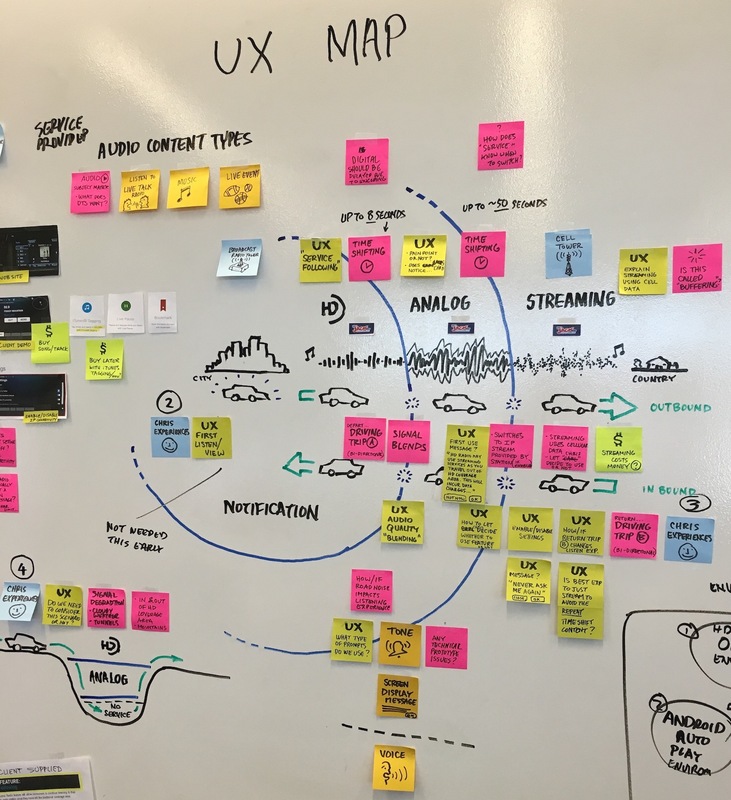 So the goal of this usability project was to explore a few different options for integrating this feature in order to make recommendations to automakers for best practices based on what we found. For this project, we partnered with an excellent consulting agency in metro Dallas. I like doing user research in Dallas because it's a great cross section of America. It's racially and socioeconomically diverse with a broad range of education and work profiles. Working closely with the project team, we helped them understand the feature concepts and high level research questions, then they created the test protocol, recruited test subjects per our specifications, and did the test moderation. My UX design team at DTS/HD Radio supported the project by specifying screen designs, collaborating on screen flow and copywriting, as well as collaborating on the analysis. I attended many of the research sessions in Dallas, as well, and watched videos of the rest. After completing the lab-based usability test, we leveraged the results to build a web-based survey which validated the results and expanded our picture of automotive radio usage generally. Outcome:The results of this study were used to inform portions of the technical specifications of HD Radio's new Connected Radio services and shape discussions with automakers on best practices. The results were also used to help design portions of the new infotainment experience I designed for HD Radio in 2017. My Role: Research and vendor manager. I made significant contributions to the test direction and analysis, as well. Additional information about this project is available for discussion upon request. Our agency partner led a workshop in Dallas to review the Station Following feature, detail the user experience challenges, and create a rough outline for the testing protocol. 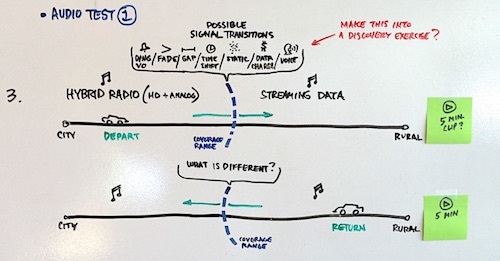 This illustration on the white board during the workshop details one of the high level research questions: How should the infotainment system cue the user on the transition from analog broadcast signal to streaming digital signal? Should there be an audio cue? And how do we notify the user as the transition to digital streaming may incur a cellular data cost when people are used to listening to the radio for free? 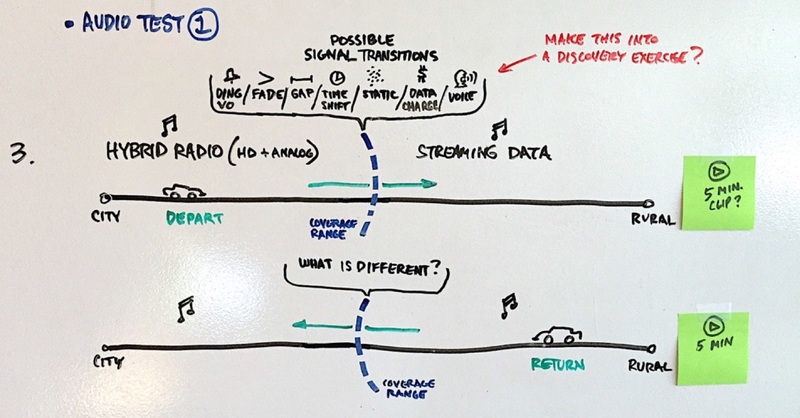 Our agency partners drew this illustration for the kickoff workshop to detail the transition points between the HD Radio, analog radio, and streaming sources in complete station following experience. Although we had shared a basic graphic with the team previously, the large illustration during the workshop helped visualize the different questions at specific points during the end-to-end experience. We conducted 3 sets of lab-based user research sessions, with each set consisting of 6 test subjects for a total of about 18 sessions. The test setup was pretty amazing. 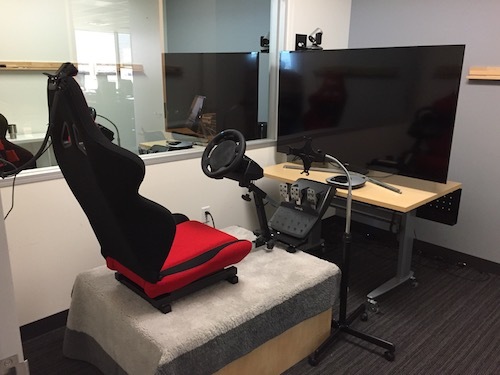 The goal was to provide a reasonable facsimile of an automotive driving experience, and it was really effective given the price point for materials. The test subject sat in a gaming chair in front of a big screen TV playing an interactive driving simulation. 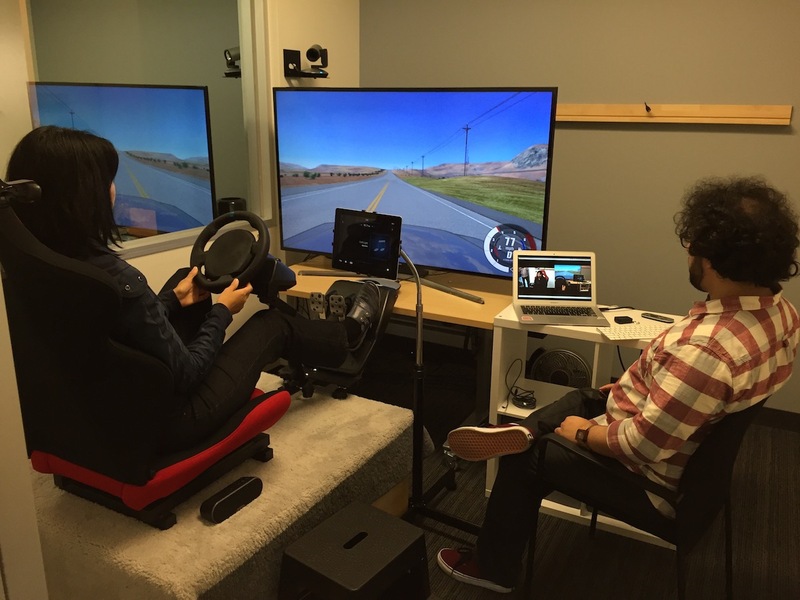 The steering wheel and foot pedals controlled the driving simulation running on the moderator's Mac laptop. There were speakers in the room playing music from an iPad that simulated the infotainment touchscreen. The test moderator from our partner agency sat to the side. To the side of the steering wheel, an Apple iPad simulated the vehicle's infotainment screen. On the iPad was an elaborate Keynote presentation that played music and looked like a real, functioning radio. The Keynote slides changed views based on user taps or timed intervals. We randomized the order of the scenarios throughout the test sessions to better control for presentation bias. 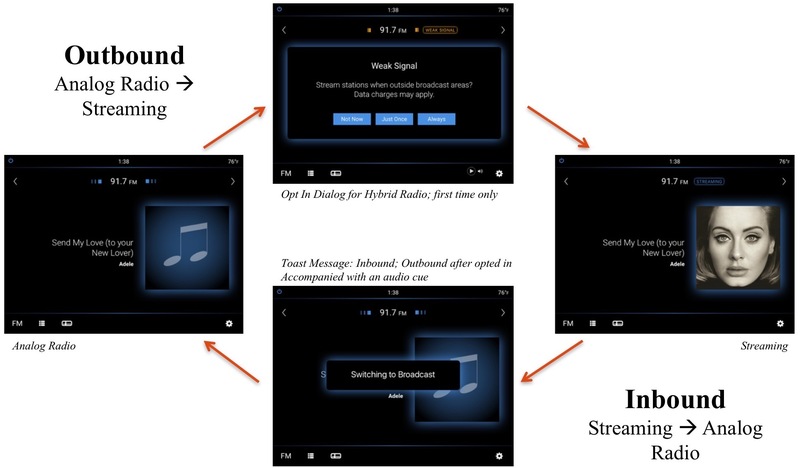 In one test scenario, we had the user concentrate on driving for around 5 minutes in a simulated terrestrial analog radio experience then transitioned with an audio alert tone to a streaming Internet source. We looked for clues and asked questions as to whether the user noticed what happened and whether they cared or it bothered them. We also asked questions regarding what they thought about why that transition happened, whether any costs were involved one way or the other, etc. Similarly, on the inbound trip from, say, another state back to the Big City, the infotainment system may automatically switch back to the terrestrial broadcast when the radio station's signal becomes strong enough. This is the path from East-South-West. When the switch occurs at the North and South points, we tested a variety of audio cues to see which one drivers would like or tolerate the most. The answers were surprising.